Vol. 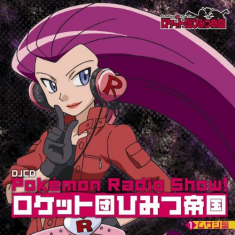 26 of Pokemon Radio Show! The Rocket-Dan's Secret Empire was broadcast on December 23rd, 2012 on 76.1 interFM in Tokyo, Japan. It is the final episode of the radio show. It aired between BW 107 ("Satoshi vs. Kotetsu! The Secret Weapon Sazandra!!") and BW 108 ("The Conclusion of the Isshu League! Pikachu vs. Lucario!!"). Nyasu: "The Rocket-Dan's Secret Empire!" Musashi, Kojirou, and Nyasu step up onto a stage in front of a group of screaming fans. After performing their Best Wishes! era motto the three of them lead a chorus of people - fans who had sent in recordings of themselves in previous weeks - into singing Rocket-Dan yo Eien ni. When the song is over the three of them return to the studio and start the show. Musashi, Kojirou, and Nyasu talk about how great the chorus of Rocket-Dan fans were. They also mention how Double Q sent them an e-mail wishing them good luck on their final episode. They know that there are some fans who doubted that this really is the final episode but Musashi assures her listeners that this is indeed the last one. Kojirou adds that they've gotten orders directly from Sakaki himself to return to the TV series and says that them being recognized by their Boss is all thanks to the fans who supported them throughout the radio show. Musashi says there's a mysterious young man named N and a mysterious organization who wants to control the Isshu Region and that the three of them will definitely beat all of them to a pulp. And while they're at it, Nyasu says, they'll capture Pikachu and earn the Boss' praise! Next, Musashi starts things off by introducing the "Welcome, Pokemon Day Care Worker!" segment. When Kojirou gets to the part of the opening where he reveals who today's guest is, Nyasu starts to mumble to himself. Before long, he reveals that he wasn't actually able to book a guest for their final show!!! Musashi gets angry and starts yelling, so Kojirou cuts to commercial. A short commercial plays for the upcoming Pokemon Radio Show CDs. The gorgeous two-disc sets will start off with the Musashi Version coming on February 22nd, 2013 and then continue with the Kojirou Version on March 29th, 2013 and the Nyasu Version on April 26th, 2013 for 3,150 yen each. The announcers add that if you buy all three CDs from Animate stores across Japan then you'll receive a special "Rare Pilot" CD. When the Rocket trio returns, the doorbell inside their studio rings - it's a package from Double Q! A memo is attached: "Congratulations! Thanks to the hard work of the Rocket-Dan members it seems like you three will return to the TV series. It's like a Christmas present!! On top of that, did you three bring a present to exchange like we agreed last week?" At this, Musashi makes an audible "gulp"; it looks like she forgot. "We got you a present. Nyasu, open the door." Nyasu grumbles and wonders why he's stuck having to open it. When he opens the door he sees a large box with a bow on it. It looks like it's big enough to hold a refrigerator! Nyasu tries to push it into the studio by himself but it's obvious that he can't do it alone so Kojirou gets up to help him. Musashi, meanwhile, stands by and chants "Refrigerator! Refrigerator!" Once the present is safely brought inside, it's time to "open the box~!" A young woman pops out of the box!? "Ta-da! It's Tsubaki Ayana!" Kojirou asks why Double Q sent Ms. Tsubaki to them and she states that she's there as a representative of Rocket-Dan fans everywhere. Nyasu says they don't have any information on her and will have to cut to commercial again to try to do some quick research. Musashi seems disappointed that they didn't get a refrigerator after all. 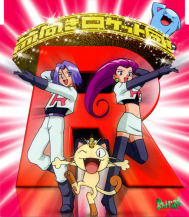 Junsa and Joi talk about the various Pokemon reruns airing on the cable network Kids Station. This week's guest is Tsubaki Ayana! She's been a fan of the Rocket-Dan ever since she was little and she's so excited to be on their radio show. She also brought them a Christmas cake! The "Welcome, Rocket-Dan Maniac" segment starts with an introductory rap. Nyasu: "Your name is Tsubaki Ayana and your primary job is a TV personality, no doubt?" Ms. Tsubaki: "Yes, I'm mainly a TV personality!" Kojirou: "What month were you born in, where were you born, and, while you're at it, tell us any nicknames yo." Ms. Tsubaki: "Yes. Um...Born in July and I'm from Saitama. My nickname's...um...I guess it's Gachi-hime (ガチ姫)." Musashi: "Gachi-hime? Well, thank you! And thank you for the cake!" Ms. Tsubaki: "No, thank you! I'm so happy that I could die." Musashi: "Don't do that! Don't die!" Tsubaki Ayana hasn't ever voice acted in Pocket Monsters before but she is a huge fan of the Rocket-Dan. The interview starts with the Rocket trio deciding to eat the cake that Ms. Tsubaki brought them. They bring some tea out and then open the box! The Rocket trio squeals as they describe the cake for the radio listeners. Kojirou has reindeer ears! Nyasu has a Santa hat where his koban usually is! They thank Ms. Tsubaki and tell her that they don't want to put a knife to it because that would ruin all the hard work she did. They'll upload pictures of it to Twitter, they say, so everyone else can see this great cake. Kojirou starts the interview off by asking Ms. Tsubaki why she likes the Rocket-Dan. She tells the trio that she's been in love with the Pokemon cartoon and games ever since she was little and that out of all that, the Rocket-Dan is the part she loved the best. She talks about how she would play the video games and make a "Musashi Party," a team consisting of the pokemon that Musashi used in the show, because that's just how big of a fan she was! She then says that she would always lose because moves like Wrap and Poison Sting weren't very good and that she would wish Musashi would have used some stronger pokemon. Musashi apologizes as the others laugh. Musashi then brings up the fact that Ms. Tsubaki followed their @Pokemon_Radio Twitter account even before the radio show officially started. Ms. Tsubaki confirms this and says that she was so happy when she heard about the Rocket-Dan getting their own show that she was moved to tears. The trio thanks her and comment on how she really is a huge fan. Musashi goes back to the question Kojirou asked earlier and asks Ms. Tsubaki why she's as big a fan of the Rocket-Dan that she is. She says that she has a ton of memories about the trio but that she really enjoyed the episode where they switched places with Yamato and Kosanji Kosaburou, Chirin departed, and any episode involving Musashi. But really, all her favorite episodes of the TV series involve the Rocket-Dan. Musashi is surprised that there's a Rocket-Dan fan as diehard as Ms. Tsubaki is. The Rocket trio then decides to flip things around and allow Ms. Tsubaki to ask them the questions. Accordingly, Ms. Tsubaki asks Musashi, Kojirou, and Nyasu to say what they like about each other and to share any memories they have that stick out to them. Kojirou goes first, saying that he's impressed with all the hard work Nyasu did in order to learn how to speak human language. Ms. Tsubaki chimes in and says that there are many moving episodes featuring the trio. As far as Musashi goes...she's "good." As everyone laughs he explains that her explosions of anger that she's known for help give her the super strength needed to carry large objects and that she helps create a nice balance among the Rocket trio. Next up is Musashi, who says that she likes Nyasu even though he's a pokemon. She explains what she means by saying that she often forgets that he's not human because of how easily they're able to communicate with one another. Nyasu adds that he's great at dressing up as other pokemon as well, such as when he dresses up like Kimawari or when he wears a trench coat. As for Kojirou, she says that she likes how he'll just disappear and then reappear behind people. She knows that if she doesn't see him then she can just turn around and he'll be there. Nyasu is up and says that he likes how Kojirou notices things that they miss and how he pays attention to the small details. Because of that, he says, they can rest easy. The end! Everyone laughs because Nyasu hasn't said anything about Musashi yet, so he says that whenever they're in trouble Musashi is great at making quick decisions. Everyone claps for Musashi. Kojirou asks Ms. Tsubaki if she has any favorite pokemon. She says her favorite one is Yukimenoko because it's pretty like a yuki on'na, it's not too strong but not too weak, and she likes its long sleeves. Musashi says that she hopes Ms. Tsubaki doesn't take this the wrong way but that she thinks she looks as elegant as a Yukimenoko, but Ms. Tsubaki is happy at the comparison. Other pokemon she likes are Fushigidane and Gomazou; Hayashibara Megumi provides the voices for both these pokemon and so Musashi starts to cry tears of joy. Ms. Tsubaki continues and says that she's made a list of pokemon she would like to see the Rocket-Dan use: a Multiscale Kairyuu, a Thick Fat Mammoo, a "Technigassa" (a Kinogassa with the Technician Ability), and "Cressdran" (a team consisting of Cresselia and Headran). Musashi thinks it would be good to use those but Kojirou points out that catching pokemon is actually one of their weak points. Ms. Tsubaki says they can leave it up to her; she's used to riding her bicycle back and forth to hatch new pokemon eggs and that after one day she can have several hundred pokemon for them to use. Musashi says that it seems like their future just got a little brighter. Next, Kojirou asks if they should admit Ms. Tsubaki into the Rocket-Dan; she's already following their Twitter and has even given them advice so she's pretty much a Rocket-Dan member already. Ms. Tsubaki, of course, accepts. Musashi asks if she has a request for a song she'd like to hear, and she responds by picking Maemuki Rocket-Dan. She says that when she heard that song when she was little she'd get all fired up and would be ready to take on the world. As per Tsubaki Ayana's request, Maemuki Rocket-Dan is played. Ms. Tsubaki signs off as the final verses of the song play. Nyasu says that it's about time they wrap up the show. How was this last half a year, he asks? Musashi astutely points out that half a year is one half of ones year, prompting Kojirou to tell her not to state the obvious. Nyasu chimes in and says that that's kind of what they do, though. Musashi goes on to express her surprise that the three of them were actually able to get their own radio show and speak to each other the way they do. Nyasu praises InterFM while Musashi states that the "Pocket Monsters" name really helped them. Nyasu adds that the "Rocket-Dan" brand has a bit of name value to it as well. Kojirou asks the others to share their favorite memories of the last half year. Musashi says she really liked the opening dramas because she, as an actor, got to have a lot of fun. She particularly liked that whole "Jesshi wa" thing from the second episode, a segment that Nyasu describes as sounding like it was narrated by a foreigner. Kojirou says that he's as surprised at him being able to pull that "foreigner voice" as the other two are. Musashi says she also really liked the one where the pilot and the heroine thought they were dying (Episode 7) and Kojirou says he liked the one where Nyasu was running up and down the train platform (Episode 8). They're also thankful for all the guests who have dropped by to visit and at Double Q for always giving them new items to try out. Nyasu is about to close out the show when suddenly a staff member shows up with an announcement! "Pokemon Radio Show - The Rocket-Dan's Secret Empire" is going to get a CD release the following year! There will be a Musashi Version, a Kojirou Version, and a Nyasu Version that will go on sale in February, March, and April of 2013. In addition, if you buy all three CDs at Animate stores then you'll get the rare pilot episode featuring Mr. Konishi! The Rocket trio thinks this is great and remark how rough around the edges that first pilot episode was. And if the CDs sell well enough...maybe the radio show will return in the summer 2013? The chorus version of Rocket-Dan yo Eien ni plays once again as Sakaki takes to the airwaves. He thanks Nyasu, Musashi, and Kojirou for all their hard work and says that they have close to 40,000 followers because of them. He then says that they'll make a big announcement on the night of Christmas Day and will then delete their Twitter account a week after that. He thanks everyone again before signing off.